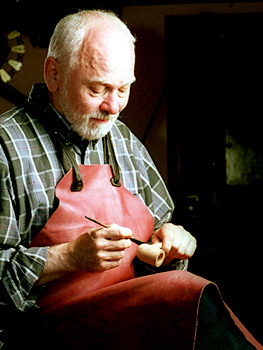 Kai Nielsen was born in 1951 in Vordingorg, and son of the late pipe maker Viggo Nielsen. Kai studied and learned the "art of pipe making" under the careful eye of his father, Viggo. Kai's hard work and love for the craft was clear in every pipe he made. His designs and skills were soon noticed and admired by many. Kai, like his father before, selects only the finest aged briar, most of which is Corsican. He also air cures the briar for a number of years to provide exceptional smoking qualities. Kai's handcut acrylic and cumberland mouthpieces are works of art. Kai's pipes became popular, first in Germany, and then in Japan and US, where he attended the Chicago pipe show. He makes 300 - 400 pipes a year. The size range varies a lot, with the smaller pipes tending to be more popular in Japan, and the larger in the US and Germany. Kai's very best pipes are called The Jewels of Denmark, and are graded seperately with letters. X is the very best and then the pipes are graded from A-D with A being the second best after X. The filter pipes are graded A, B, C, and D and the non-filter pipes get one to four V's. This way he never has to seperate a stem from a pipe to see if it has a filter. Kai uses Ebonite, Cumberland, and occasionally acrylic for his stems.